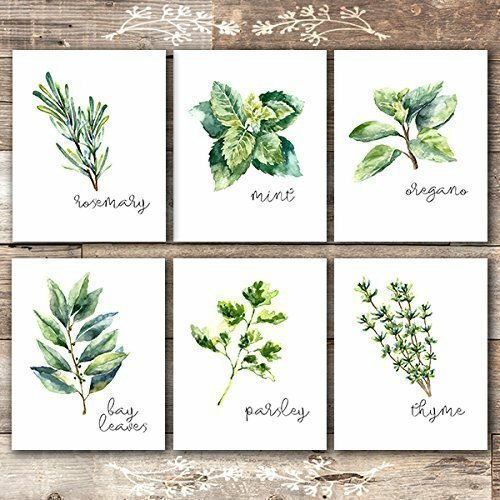 This set of kitchen art prints includes: rosemary, thyme, mint, parsley, oregano, and bay leaves. 100+ 5-STAR REVIEWS AND COUNTING! I'm so proud of all of the glowing reviews my amazing customers have already given this set, and be sure to check out the product review photos customers have posted to see how this beautiful set could look in your home! This set is extremely versatile depending on how you choose to frame and display it! Rustic wood frames will create the classic farmhouse decor look, while simple black frames will display your kitchen art with a modern elegance. This set is just one of many I offer! Check out my shop page by clicking "Dream Big Printables" at the top left of this page, and browse my wide variety of wall art - there's something for everyone!